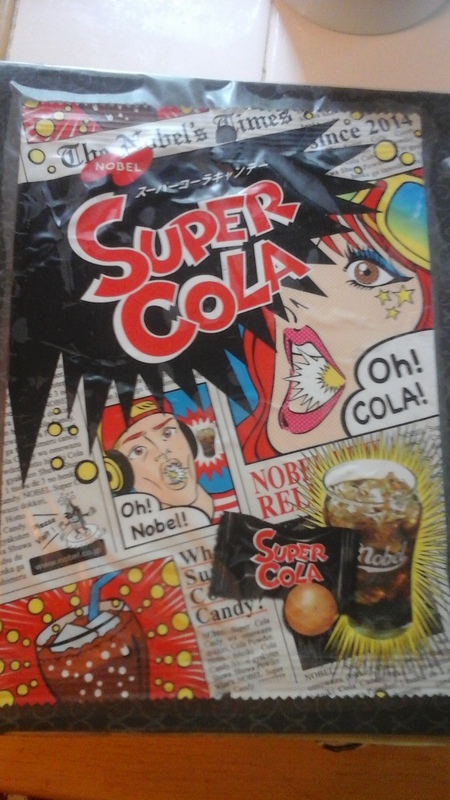 The Super Cola on the back is from a bag of candies Ian bought at the Chinese Supermarket in Albany. I thought it had such a fun design that I wanted to incorporate it into this piece. Packaging has served me well. Now, about Arche Klaine and Chester Barklight: When I was a kid, I got Nintento Power magazine every so often at the bookstore (I didn’t have a subscription) and the March 1996 issue was my favorite. It had Chrono Trigger, Super Mario RPG and Tales of Phantasia. I loved the big-eyed look of anime, which, at that point, had barely made it to the states, let alone Upstate NY. I loved Arche’s costume and made one for myself, right down to the weird tunic, all by hand. The game never got a translation on the SNES, and the magazine probably got thrown out somewhere. The costume was recycled into something else, and Tales of Phantasia was forgotten. But as I started Lords of Yesterday, I got thinking about those old magazines and ordered a couple issues for papercraft. And there was Arche, looking cheerful as ever, in between the pages. 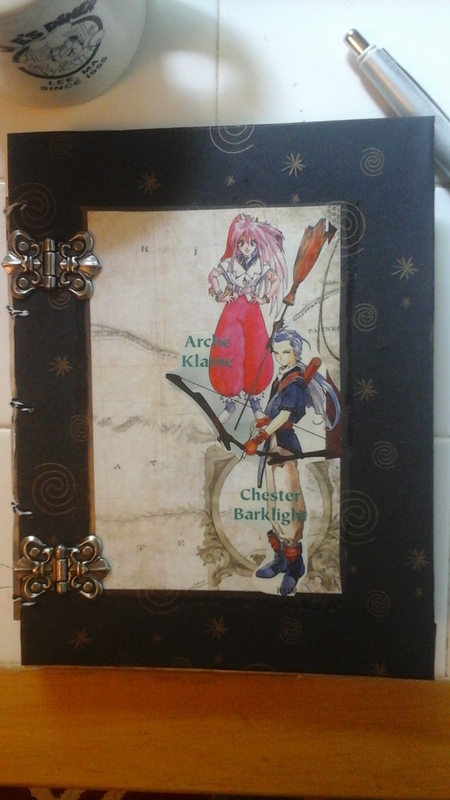 I cut up the other articles for page collage and postcards, but I wanted to save Tales of Phantasia for something special….and this notebook was it. French Stitch is my go-to because it’s flexible and I can do it while watching TV. I had some brown sketch paper leftover from a journal my husband & I made for our honeymoon road trip, although I had to tape smaller pieces of it together to form double-truck signatures. No envelope this time; while it was useful for keeping collage pieces, at the end of the notebook’s usage, it would be emptied. 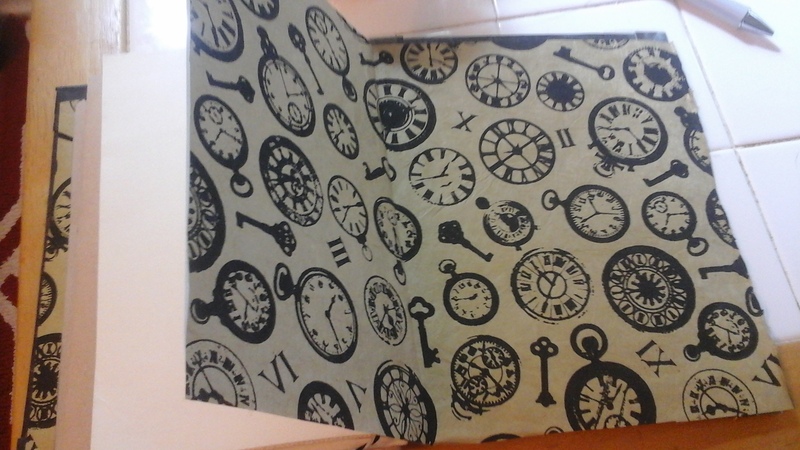 Finally had a chance to use my beautiful, handmade clock paper as endpapers, which, the more I do, the more I’m a fan of. Now I just have to get to writing in it! That clock paper is amazing. I support “no regrets”! The notebook is lovely, and I envy the aesthetic every time you show one off. (i even recently bought a new “lay flat” style notebook, because of you. No, I haven’t written anything in it yet).